Your hat ceremonies are weak. After current members of Auburn’s volleyball team told her that Rick Nold and Co. really dig creative commitments, the lovely senior volleyball standout from Palm Springs High (CA) took washable blue and orange chalk paint and decorated the shell of her 8-year-old, 210-pound African desert tortoise with the Auburn University logo. She took a picture. She emailed it to Auburn. 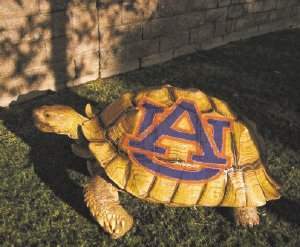 War Eagle. The 5’9″ setter is signing her national letter of intent to play for the Tigers in two weeks and plans to major in journalism. No word on whether the tortoise (named Bo) is coming with her, or whether PETA would care. You are correct, she is lovely and talented, and artistic. Oh yeah, she plays a mean game of volleyball too! War Eagle Miss Richards, welcome to the family.